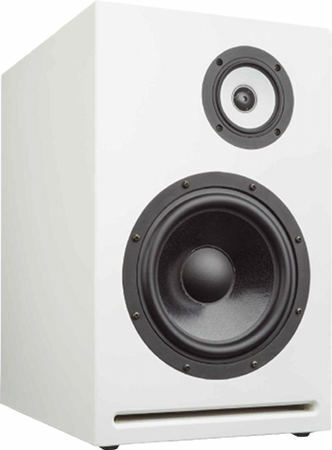 The Exclusiv 3/8 is an speaker you can build in two versions, as a compact bassreflex speaker, or as a TQWT floorstanding speaker. The plans for both are delivered with the kit. Both are delivered with the Omnes Audio CX 3.0 coax and the Omnes Audio Exclusiv 8 woofer. Omnes Audio Exclusive 3/8 is developed by Thorsten Fischer. The crossover consists of a 2nd order high-pass filter (12 dB per octave slope) for the tweeter-part of the coaxial loudspeaker. The midrange part is connected to a 2nd order bandpass filter (12 dB per octave slope). The woofer is connected to a 3rd order low pass filter (18 dB per octave slope). The frequency response of this speaker is linear. The decay spectrum is nearly perfect. At low volume, i.e. 85 dB at 1 m, the nonlinear distortions are lower than 0.5% above 500 Hz and stays below 1% at 95 dB at 1 m .
The high-end kit is delivered complete with baked varnish air core coils for minimizing microphonic effects. - The current flow through the coil creates a magnetic field which sets the reel of wire in motion. This motion induces a voltage in the coil which adds itself to the signal. The stiffer the reel of wire is, the less the signal will be altered. All capacitors are polypropylen or polystyrol type and for the midrange and tweeter Clarity-Cap PX 250V and ESA 630 V are employed.